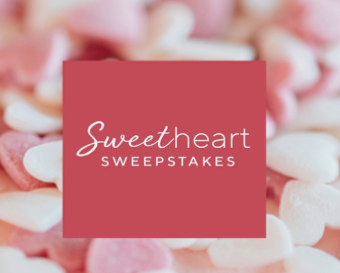 QVC Sweetheart Sweepstakes – Win $500! ENTER SWEEPSTAKES HERE – QVC Sweepstakes page. ENTRY LIMIT – Each day’s sweepstakes is a separate promotion with a different pool of entries. (one entry per day). ELIGIBILITY – Entrants must be 18 years of age or older and reside in the U.S. or its territories. However, residents of Rhode Island are not eligible to participate in this sweepstakes promotion. 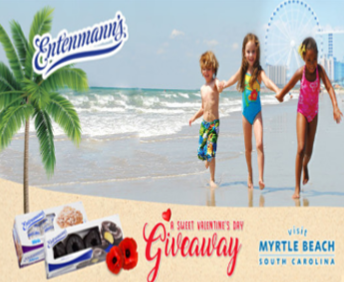 SWEEPSTAKES ENTRY PERIOD – The promotion begins on February 7, 2019 @ 12:00:00 AM EST and ends on February 14, 2019 @ 11:59:59 PM EST. WINNER’S LIST – For a winners list, send a self-addressed stamped envelope to QVC – BEAUTY WEEK SWEEPSTAKES, QVC Studio Park, West Chester, PA 19380. 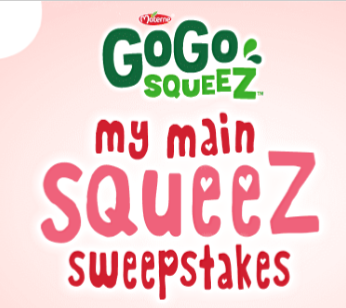 GoGo squeeZ® My Main squeeZ Sweepstakes – Win a case of GoGo SqueeZ & more! Win a case of GoGo SqueeZ and a Valentine’s basket! ENTER SWEEPSTAKES HERE – GoGo SqueeZ Sweepstakes page. ENTRY LIMIT – Limit one (1) entry per person, per day, during the Promotion Period regardless of the number of email addresses or accounts a person may have. ELIGIBILITY – The Sweepstakes is open only to legal residents of the 50 United States and Washington D.C., who are at least 18 years of age (or the age of majority in the jurisdiction of their residence, whichever is older). SWEEPSTAKES ENTRY PERIOD – The Sweepstakes begins on or about 10:00 A.M. Eastern Time (“ET”) on 1/21/2019 and ends at 11:59:59 P.M. ET on 2/7/2019. PRIZES – One (1) winner will receive one (1) case of GoGo squeeZ® applesauce (40 pouches) and a Valentine Gift Basket. Total Average Retail Value: $150.92, which will vary depending upon mix of applesauce. Harry & David ‘Paradise For Two’ Valentine’s Day Sweepstakes – Win a trip to Jamaica! 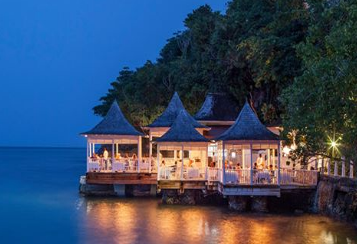 Win a 5-night stay at Couple’s Resort in Jamaica! ENTER SWEEPSTAKES HERE – Harry & David Sweepstakes page. ENTRY LIMIT – There is a limit of one (1) entry per person per day during the Entry Period. ELIGIBILITY – The ‘Paradise For Two’ Valentine’s Day Sweepstakes is open only to legal residents of the fifty (50) United States and the District of Columbia who are at least twenty-one (21) years old at time of entry. SWEEPSTAKES ENTRY PERIOD – The Sweepstakes begins at 12:01 a.m. (Pacific Time) on February 1, 2018 and ends at 11:59 p.m. (Pacific Time) on February 14, 2018. PRIZES – One grand prize winner will receive a five-night getaway for two at one of four all-inclusive, Couples Resorts’ oceanfront properties in Jamaica, plus up to $500 in airfare person. The Grand Prize winner will be sent a letter at a delivery address provided by the Grand Prize winner with a unique prize code, which he/she can use to book the stay no more than sixty days in advance. Complimentary nights are reserved in the entry-level room category and black out dates apply. Couples Resorts will handle reservations and ticketing for the desired flight(s) of the winner and one guest. If the amount of a flight exceeds the $500 per person allotment, the winner will be responsible for the difference. In such event, a credit card authorization form will be sent to the winner to fill out and return to Couples Resorts prior to booking the flight. Two runner-up winners will each win a $500 Harry & David gift card, which will be shipped by standard ground delivery to a delivery address provided by the runner-up winners. Winners may waive their right to receive the prize, but will not receive an alternate prize or any cash value. Prizes are not assignable or transferable and are not redeemable for cash. The Sponsors reserve the right to substitute a prize of equal or greater value. Winners are responsible for reporting and payment of any taxes on their prize. Approximate Retail Value (ARV) of Prizes: The ARV of the Couples Resorts getaway for two is USD $2,500.00, plus two airfare credits of up to USD $500.00 each. The ARV for each Harry & David gift card is USD $500.00. The ARV of all prizes is USD $4,500.00. Hallmark Channel® Countdown to Valentine’s Day Sweepstakes – Win a trip to Jackson Hole, Wyoming! Win a trip to Jackson Hole, Wyoming! 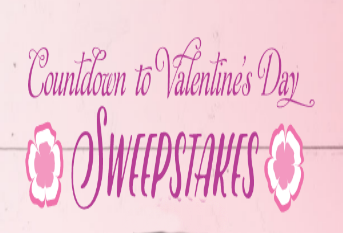 SWEEPSTAKES ENTRY PERIOD – The Hallmark Channel® Countdown to Valentine’s Day Sweepstakes begins at 9:00:00 AM Pacific Time (“PT”) on Friday, January 26, 2018 and ends at 8:59:59 PM PT on Thursday, February 15, 2018. PRIZES – Grand Prize: One (1) Grand Prize winner will receive a trip for up to four (4) (i.e., winner and up to three (3) guests), to Jackson Hole, Wyoming. Actual value of trip depends on location of winner’s primary residence, destination, fares at time of travel and land accommodations. If actual value of the trip is lower than ARV stated herein, the difference will not be awarded. Round trip coach airfare for Grand Prize winner and up to three (3) guests to Jackson Hole, WY from a major airport within the 48 contiguous US nearest the winner’s residence as determined by Sponsor. Up to Two (2) double-occupancy hotel rooms for two (2) nights/three (3) days at Spring Creek Ranch. Up to Four (4) spa treatments, one (1) for winner and one (1) per each guest. Round trip airport transfer in Jackson Hole, WY. ARV of Grand Prize: $6,500.00. 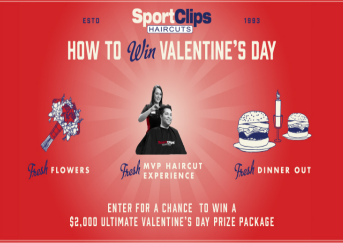 Sport Clips® “VALENTINE’S DAY GAMEPLAN” Sweepstakes – Win a prize package worth $1800! Win a prize package worth $1800! ENTER SWEEPSTAKES HERE – Sport Clips Sweepstakes page. ENTRY LIMIT – There is a limit of one (1) entry per person/email address, per day. ELIGIBILITY – Sweepstakes is open to legal residents of the 50 United States and the District of Columbia (the “Eligibility Area”) who are at least 18 years of age as of the date of participation. SWEEPSTAKES ENTRY PERIOD – The Sport Clips® “VALENTINE’S DAY GAMEPLAN” Sweepstakes begins at 8:00 A.M. Eastern Time (“ET”) on 1/22/18, and ends at 5:00 P.M. ET on 2/9/18. PRIZES – GRAND PRIZE: One (1) Google Home Max; One (1) $400 VISA cash card for flowers and dinner; One (1) $500 Marriott Hotel Gift Card; One (1) $300 VISA cash card for a year of free haircuts; One (1) Male Grooming Kit and One (1) Female Grooming Kit. The total approximate retail value (“ARV”) of the Grand Prize is $1800.00. 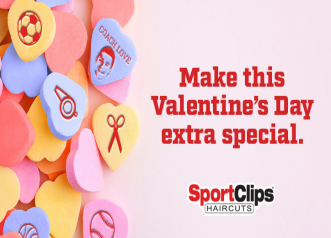 Sport Clips® “Valentine’s Day Gameplan” Sweepstakes – Win a PlayStation 4 Bundle, gift cards & more! Win a PlayStation 4 Bundle, a $200 Visa gift card, free haircuts for a year & more! ENTER SWEEPSTAKES HERE – Sports Clips Sweepstakes page. ELIGIBILITY – Sweepstakes is open to legal residents of the 50 United States and the District of Columbia who are at least 18 years of age as of the date of participation. SWEEPSTAKES ENTRY PERIOD – The Sport Clips® “VALENTINE’S DAY GAMEPLAN” Sweepstakes begins at 8:00 A.M. Eastern Time (“ET”) on 1/23/17, and ends at 5:00 P.M. ET on 2/8/17. One (1) Male Grooming Kit and One (1) Female Grooming Kit. The total approximate retail value (“ARV”) of the Grand Prize is $2200.00. 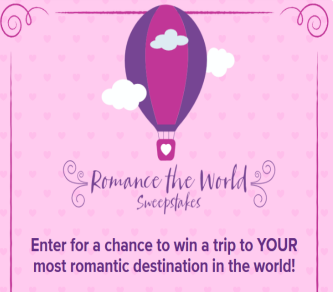 Hallmark Channel Romance the World Sweepstakes – Win a trip to your most romantic destination! Win a trip to your most romantic destination (winner gets to pick the location)! SWEEPSTAKES ENTRY PERIOD – Entries must be received between Wednesday, January 25, 2017 at 9:00:00 AM PT and Wednesday, February 15, 2017 at 8:59:59 PM PT. PRIZES – Grand Prize: One (1) Grand Prize winner will receive a trip for two (2) (i.e., winner and one (1) guest), to winner’s choice of his/her most romantic destination in the world. -Round trip coach airfare for Grand Prize winner and one (1) guest to/from the closest commercial airport nearest to winner’s primary residence to a major airport closest to the winner’s choice of his/her most romantic destination. -Double-occupancy hotel accommodations for three (3) nights/four (4) days (selection of hotel is at the Sponsor’s sole discretion). -One (1) Romantic Dinner for two (2) in chosen destination (selection of restaurant is at the Sponsor’s sole discretion). -Round trip airport transfer in chosen destination. -Airline and accommodations taxes and fees. ARV of Grand Prize: $11,360. Harry & David® Valentine’s Day Sweepstakes – Win a $1,000 Harry & David gift card! Win a $1,000 Harry & David gift card! ENTRY LIMIT – There is a limit of one (1) entry per person during the Sweepstakes Period. ELIGIBILITY – The Harry & David® Valentine’s Day Sweepstakes is open only to legal residents of the 50 United States and the District of Columbia who are at least 18 years old at time of entry. SWEEPSTAKES ENTRY PERIOD – The Sweepstakes begins at 12:01 a.m. Pacific Time (“PT”) on January 20, 2017 and ends at 11:59 p.m. PT on February 14, 2017. PRIZES – On or about February 20, 2017, one (1) potential Grand Prize winner will be randomly selected among the valid entries to receive a $1,000 USD Harry & David® gift card. Ten (10) separate potential runner up winners will also be randomly selected to each receive a box of Harry & David® Signature Chocolates Truffles (or truffles of like value). APPROXIMATE RETAIL VALUE OF EACH PRIZE: $1,000 USD for the Harry & David® gift card and $29.99 USD each for the Harry & David® Signature Chocolates Truffles. 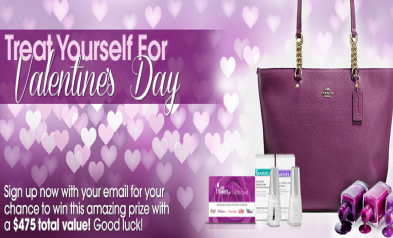 Barielle “Treat Yourself for Valentine’s Day” Contest – Win a Coach Handbag & more! Win a Coach Handbag & more! SWEEPSTAKES ENTRY PERIOD – The Sweepstakes begins at 9:00 AM EST on February 2, 2016 and ends at 11:59:59 pm EST on February 28, 2016. PRIZES – ONE GRAND PRIZE WINNER WILL BE AWARDED a PRIZE: One randomly chosen participant will win a prize. Sponsor will not replace any lost, mutilated, or stolen prizes.